This beautiful arch has unique 'Twisted cage' finials, which are hand made in the forge, using an old, almost forgotten technique, that only a true master of his craft can make. For the same item but made in bolt together sections for restricted entrances the price is : £810. These prices are for a standard finish (two coats of semi-black metal paint) and the size as above. For different size / finish / finials etc please see our specifications page. 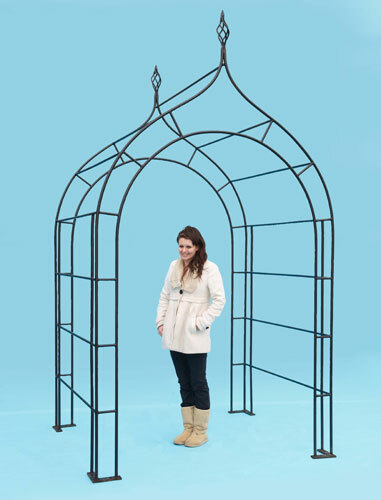 This arch comes with (8) pins which need to be knocked through holes in base plates to secure item in situ.